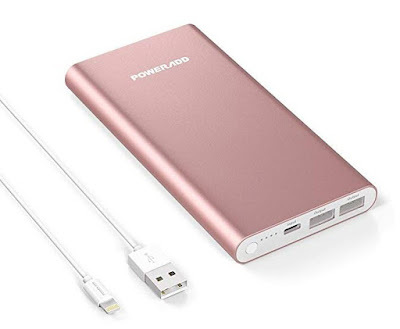 Today only, this POWERADD Pilot 4GS Apple Lightning Portable Power Bank External Battery Charger is on sale for $18.49 (Retail $25). There are 4 colors available at this price. -ID Indentify Tech – Auto detect the charging requirement from your devices and allow simultaneously charging for your devices up to 3A(max) per port; which means you only 1 hour to fully charge your iPhone 6 with Pilot 4GS. -Powerful Capacity – 12000mAh rechargeable capacity provide more than 4 solid charges for an iPhone 6/6S, or about 2 charges for an iPad Mini, which means you get a charging station while you are on a long-term journey. -Intelligent Safety Protection – Grade A+ Li-polymer cell premium microchips multi-protect system Supports over-charged, over-discharged, over-voltage, over-current and short circuit protection; supports 500+ recharge cycles over the life of the battery. -Compact Design – A fresh anodized finish with aluminum alloy body Unique Anti-Fingerprints design, more cleanly on its surface the same size like iPhone 6s make it easy to carry.